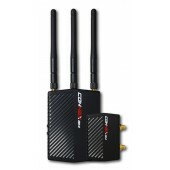 CONNEX Mini zero-latency HD wireless video link, is a new and smaller product in the CONNEX products family. CONNEX mini delivers full HD video quality, zero latency and digital transmission reliability for live and sensitive shots. CONNEX mini allows users to get perfect camera alignment for zoom and focus, while providing the best most profound real time video for true professionals. CONNEX employs Amimon’s revolutionary HD video technology, widely regarded as the industry standard for wireless video in the broadcast and cinematography market.